funny enough, I don’t swear that much but drop a hell lot of f-bombs in my own thought process which ends-up on screen. When doing that I try to capture the essence, most of the time bullet points only which serve as outline and key points I can to write about. one thing I like to do is to take the outlines I create early mornings to the park and have do a braindump on them in audio for later editing. I generally make it a rule not to swear online, which makes this post a bit unique for me. It’s great to hear that you are writing down your key points and then working from that outline, Guilherme! get it down….now! I think I will try the blindfold! And, I see the Genesis ad and that reminds me that it’s time for me to switch. Thanks! Diana, thanks for the compliment on the post. I wanted to provide actionable tips without being overwhelming. Let me know how your “blindfold experiment” goes! Good article with some actionable advice. For me, it all boils down to having an idea already before I even start drafting posts. I keep a list in Evernote of around 50 post titles that I could write a blog post about. I have categorized these post titles in different topics and the title itself should give a pretty good idea what the future post is about. When drafting content I make sure to block out my calendar so I am only doing that, thus allowing myself no distractions. If I feel at a particular moment the current situation/mood/creativity sparks better around a different post title, I don’t sweat it and choose that one instead. I personally think it is all about preparation but also about setting the mindset and motivation for yourself. In the end, there is nothing more demotivating and that is a white screen with a blinking cursor and no idea what to write about. Joep, it’s great that you keep a list of ideas for your posts! That shows you’re organized, which is often half the battle! Preparation is key, for sure. Thanks for your comment, and sorry it took me so long to reply. There were some issues in the comment approval process. Plus, I’ve been on vacation! I am stream of consciousness all the way. I write without stopping, which is why I have written and published one, 6,000 to 7,000 word eBook daily to Amazon over the past 6 weeks. Every day, I write one and publish it. This feat would be impossible if I stopped to edit or if I wrote in any fashion other than the stream of consciousness bit. As for writing blindfolded I sometimes write as I watch the TV or as I hold chats with other folks. Really fun way to detach from work while seeing what flows to the Word Doc. Fun tips. Thanks for sharing! If I type my draft in Word or an email to my assistant, I’m able to do the stream-of-consciousness thing, or at least get my ideas out without worrying about it being perfect. But if I try to do it right in my blog, it feels too real, and I’m constantly fussing over the right word choice and other details that are better left to the editing stage, even though I know it’s not the final version. Janet, sometimes we need that extra push of comfort in order for us to write a great draft. It’s good that you’ve identified this issue and have found an alternative way to combat it. I rarely write posts in my WordPress editor; I generally write my draft in Word, too! It’s important to be yourself. People like realism and truth. I do Stream-of-Consciousness Writing for almost all writing I do. I find that for me it’s quicker and more effective, especially when I have a goal of writing two or three blog posts in a night. I know it sure helps when you have a lot on your plate. And it’s well written and very informative. 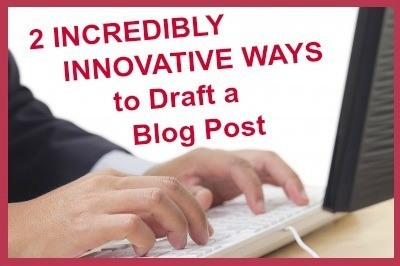 It is difficult to write a blog post within less time. Blog post take time to insert keywords, images and also unique and effective content needs for make a blog post attractive. I am a part time blogger word press. Thanks for sharing awesome content. Buesi, blogging takes time, and writing a blog post is only a fraction of the work! Great post. I really did not think much about my writing habits until reading this. And actually I kinda write blindfolded and go back to read just for keep together the content. I leave all the editing stuff for the next level – editing the post. I guess I got this habit at work as I have to write and send several emails each day and I use different languages. And if I stop to edit I take a huge risk to switch the language. It happend to me several times to start writing in French for a French client and after an editing break to go on in English. And of course I had to re-write the English part. So I learned that I have to write all the email/post and edit&correct after. Marcela, I only know English, so I don’t have the problem of having to “think in French” (or any other language, for that matter). I can see the issue you’ve had, though, and appreciate your comment. Writing and editing are two separate events, and it’s great to see that you know this, too. It makes us more productive when we know the difference! Great post. I don’t tend edit as I write – which is a bit of a blessing – but I really like the idea of blindfolding myself and just going for it. I might just cover the screen though rather than myself (I’d probably scare the dog!). Stream of conscious writing is pretty much how I write – and then I heavily edit it afterwards too. Heather, that’s a great idea, covering the screen! It probably will make you feel a little less awkward, too. I love it! I also do a lot of blog writing and editing at the same time and it is really counter-productive doing both together. So here’s a tip that I use to write “blind-folded.” I simply turn off the computer screen and then I can type to my heart’s content without the temptation of editing. When I turn on the screen again there is my blog post live and well and I can edit it as much as I like. Though I must add that when I want to be really creative, the best way for me is to write with a pen and paper. Somehow the thoughts flow directly from my brain to the paper without that bossy editor looking over my shoulder. Sandra, I often write using a pen and paper. At least, I used to. I don’t so much anymore. However, turning off the screen (or covering it, like Heather, above, mentioned), is a great idea, too! Stream of consciousness is a great way to write. I always start blog posts by throwing down anything that comes to mind. Many times during the day thoughts will come and I put those down too. Its a collecting process. After that I put all these scribbles into a (hopefully) coherent post. Its definitely accessing two important parts of the brain. Laurie, I keep a notebook specifically for my blog ideas. Then, when I am ready to write, I make an outline of the important points, fill in the gaps, edit and then format it. Generally speaking, working in stages like that is best in order to produce a “winning” post! It’s great to see that you follow the same steps to success! Great to see you here! What great tips. I haven’t done the stream of consciousness but it seems awesome. Much more freeing than editing yourself as you type. I’ll have to try that out for the future. As for blindfolding myself…eh…not sure about that! I think if you’re as honest as you can when you write a blog post it should be well received. People can tell if it’s phony or not real. Elna, sorry for the late reply. Sorry, too, for having to cancel our coffee date at Starbucks; I missed talking to you! We will have to make it up soon! Thank you your “Methods” came at a good time, I will definitely try them. Lynn, I hope you have had a chance to try them by now. Did they help? Let me know! I love the idea of stream of consciousness writing. Whenever i get frustrated writing i just start banging out words to get the damn article done. Nicholas, stream-of-consciousness writing is great when you’re feeling feeling frustrated! My preferred method is to have a short of vodka for every sentence. As a consequence my articles begin with esteemed decorum, yet gradually trail off into outright vitriol and insanity. Haha! Jareth, the one thing you need to remember, however, is to edit your work! Hi, I just wanted to let you know that my comments are not showing up. I’ve replied to everyone here, and am leaving this one as a test to see if IT shows up. Perhaps they will all be visible once they are approved? I loved the article,it was very much informative and a hint of humor made it a fun reading overall. I’m an aspiring blogger,so I found the techniques to be really helpful.Stream of consciousness looks like a method with much more freedom,I will surely try it out. P.S: If I need your help sometime,how do I approach you? Along the lines of writing while blindfolded, dictation is also great way to stop the self editing process. If you have a writing partner who can type fast, this is really easy. :) If you work solo, then the dictation built into Mac OSX is a good way to get started. Then if you really like it, you can graduate to something like Dragon Dictate. I’ve never heard of Dragon Dictate, so thank you for sharing that resource. I’ll have to check it out! Hi Max. You know, I didn’t think about how this post would apply to you. Hmm. Since you’re blind already, there’s no need to blindfold yourself literally, but turning your screen reader off is a great way for you to “blindfold” yourself. Try it and let me know how it goes, and if it helps. By the way, most people who know you and know you’re blind are more forgiving of errors they can see. But your eloquent way of expressing yourself is also indicative of your amazing ability to communicate in a conversational manner. People appreciate that, Max. I want you to know that. Hi Lorraine, back when I started with this “internet marketing” thing I too suffered from the same crutch. I would edit incessantly while writing and that reduced the speed with which I could complete a post. Back then I chanced on a post by Daniel Succo who said that writing and editing are two separate processes and since then I tend to do only one thing at a time. I do have a problem that I tend to leave mistakes as such in the editing phase due to oversight. So I sometimes highlight some portions while I am writing so that I don’t miss anything. Joseph, Daniel is a smart guy, and knows what he’s talking about. It’s great to hear that you’ve identified the difference between writing and editing, too.